This Chinese retail licence is in two versions – English and Chinese. The licence is granted by a producer of retail goods to a licensee to manufacture the goods for retail sale in a foreign country. The company granting the licence, the licensor, provides know-how and technical support to the licensee who undertakes the manufacture and sales. The 16 clauses plus schedule covers such matters as grant of the licence, duration and the obligations of the licensor which include provision of technical support and, in some circumstances, supply of components for manufacture, advertising literature etc. The licensee’s obligations are then dealt with. This agreement is designed for use by a company which manufactures a product and wants to increase its income by licensing a company in another country to manufacture and sell those products in that country. The company granting the licence, the Licensor, will provide the know-how that the Licensee requires as well as providing technical support. The Licensee will pay the Licensor a percentage on all products sold by the Licensee. Sometimes an agreement such as this also involves the Licensor acquiring an interest in the Licensee and the two parties may want to establish a joint venture company in which the Licensor has an equity interest as well as obtaining a royalty. Alternatively, the Licensor may want an option to take up equity in the Licensee if the venture is successful. These provisions are not covered by this agreement, but they can be inserted. Some defined terms are set out here. This clause sets out the principal objective of the agreement, namely the grant of a licence – specified here as an exclusive licence, authorising the Licensee to manufacture and sell the range of products that are to be listed in a schedule to the agreement. Clause 2.2 allows for the Licence to be extended to new products. Clause 2.3 restricts sales to the territory in which the Licensee is located (but see clause 9). Clause 2.4 makes it clear that the Licensor is not reliant on some third party for the right to manufacture – this is clearly something that the Licensee should check out in advance. Clearly an agreement such as this will require time to establish and capital will have to be injected by the Licensee. The agreement is therefore likely to be fairly long-term in nature. Termination, other than in the event of some serious breach, should also be on a reasonably long notice period – probably at least 6 months and possibly longer. 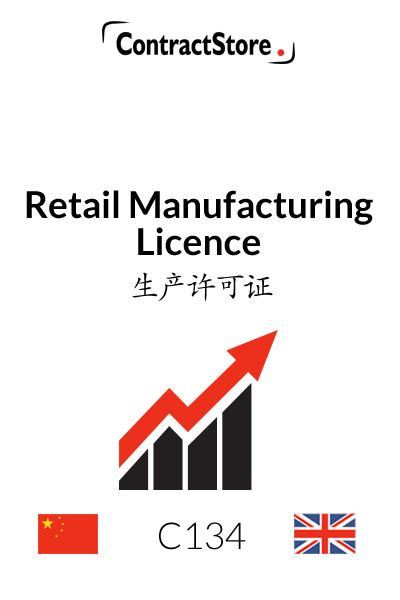 Here we have provided for the Licensor to provide all documents and electronic data that the Licensee needs in order to undertake manufacturing. This will be provided free of any cost. The clause also deals with technical back-up: in clause 4.2 the Licensor is required to provide technical assistance but, as drafted, any visits to the Licensee’s factory will be at the Licensee’s cost. Clause 4.3 deals with the updating of information – over a long period the manufacturing methods may change, products may be refined etc. Clauses 4.4 and 4.5 provide for components, packaging and advertising to be supplied directly by the Licensor or a third party supplier meeting product standards set by the Licensor. Where supplied by the Licensor, clause 4.6 provides for the Licensor to recover costs plus a handling/delivery fee. This clause imposes some fairly reasonable obligations on the Licensee to conduct its operations efficiently and in accordance with good industry practice as well as compliance with local law and regulations. The Licensor has the right to visit the Licensee’s factory from time to time under clause 5.3. Clause 5.4 deals with the situation where local regulations might impose a requirement that conflicts with the standards imposed by the Licensor. This clause allows for those standards to be varied to avoid this problem. It is unlikely to happen in many cases, but it can do so – e.g. if the products being produced by the Licensee are food products where health and safety regulations can vary from country to country. The Licence being granted extends not only to manufacture but also to the use of the Licensor’s trade names which may already be internationally known and therefore of value to the Licensee to promote the products. 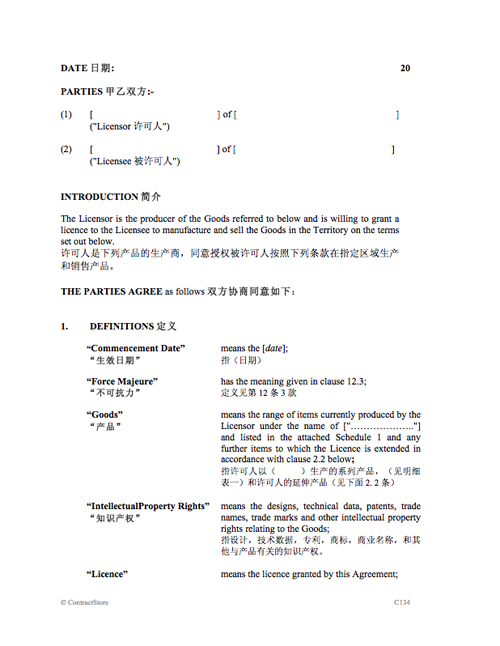 This clause deals with trade names and other intellectual property rights. The clause does not, as drafted, give the Licensee the right to register any of the Licensor’s trade names. Rather, it allows the Licensor to apply for registration of its trade names and other intellectual property in the Licensee’s territory. In clause 6.4 the Licensee is required to notify the Licensor if some third party infringement occurs in the territory, but any legal proceedings to rectify the position will be at the Licensor’s expense as it is the Licensor’s proprietary rights which are being protected. Clause 6.5 is clearly important as it requires the Licensee to stop using any of the Licensor’s trade names etc when the agreement comes to an end. This clause specifies the percentage royalty the Licensor will receive on Net Sales (the meaning of Royalty Period and Net Sales were defined in clause 1). The other provisions of clause 7 deal with the method of calculating royalties, accounting and payment arrangements. In clause 7.4 there is provision for a minimum royalty which is payable regardless of whether the Licensee makes any sales. Since there will be an initial period when no sales are made, the minimum royalty will not apply to the first royalty period under our draft. In clause 7.5, the Licensee is free to fix its own prices for the Goods, but this would not necessarily be applicable – manufacturing costs will vary from country to country but some uniformity of pricing may be desirable. Clause 7 needs to be carefully drafted depending on particular circumstances and risks – for example, the Licensor will not want to find the Licensee sells all products to another company in which it has an interest at a greatly discounted price so as to reduce the amount of royalty payable to the Licensor. This clause requires the Licensee to maintain accounts and to submit a statement with all relevant information for each royalty period. The clause goes on in clause 8.2 to require the Licensee to have an internationally recognised firm of auditors who (under clause 8.3) must produce a certificate confirming the net sales upon which royalty payments are based at the end of each year. The final clause 8.4 gives the Licensor the right to inspect the Licensee’s accounts, either directly or through its own auditors. Depending on the arrangements contemplated by the parties, the Licensee may or may not be entitled to export Goods which he manufactures to other countries. Under our draft, export is permitted only if consent is obtained but that consent will not be withheld unless the Licensor itself trades in the country concerned or there is already another licensee or agent in the country to which the Goods are to be exported. We have provided for export prices to be subject to Licensor’s approval. Both parties under this agreement will obtain confidential information concerning the other and the use of that information is restricted by this clause. The clause then deals with what happens in the event of termination – not an entirely straightforward matter in a case such as this. Where some unforeseen event which is outside the control of the parties occurs, the affected party is relieved of its responsibilities under the agreement and, as mentioned above, if the force majeure event makes the contract impossible to perform for more than a specified period, either party has the right to bring it to an end. Although not stated here, force majeure should not be used by a party to avoid making any payment which becomes due under the agreement. Neither party is permitted to transfer its rights or obligations without the other’s consent. A standard clause, but a useful one providing for the method of serving notices under the agreement. Since there may be lengthy negotiations leading up to an agreement such as this, this clause makes it clear that those negotiations cannot be relied on and the only terms governing the relationship between the parties are set out in this agreement. There is free information you can download on our website dealing with governing law and arbitration.